While the idea of climate change mitigation strategies are mostly well developed at global, national, and local levels, the field of climate change adaptation has become increasingly important and relevant. In the fall of 2016, a group of 12 ELEEP members visited London, Brussels and Rotterdam to get a feel for the many different facets of climate change adaptation in Europe. In the three different cities visited, the topics covered included local, national, and EU-level adaptation strategies, and site visits related to green infrastructure at the city level, as well as grey infrastructure such as storm surge barriers. 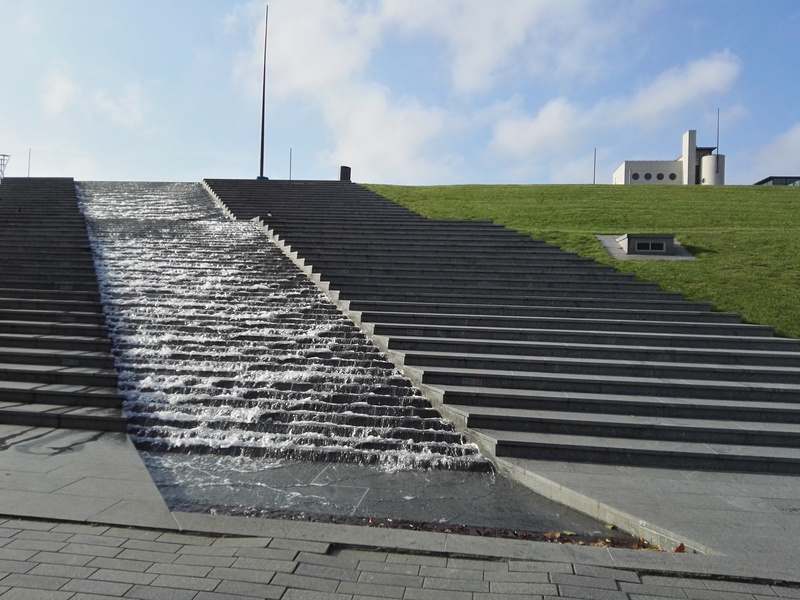 At the national level, the UK has a fairly forward thinking approach to adaptation. The topic is addressed at many levels and is thematically relevant to multiple government entities. As such, the group met jointly with the UK Department for Environment, Food and Rural Affairs (Defra) and the Committee on Climate Change’s Adaptation Sub-Committee (ASC). These two bodies work together on many issues; Defra leads coordination of adaptation activity under the UK’s Climate Change Act, while the ASC advises and scrutinizes the adaptation actions being taken. Both organisations were eager to present their work to the group, with a total of 6 speakers joining from the highest levels of Defra and the ASC. While in London, the group also met with various actors operating on the same issues at the more local level. The London Climate Change Partnership (LCCP) is a group made up of public, private, and community organisations that share expertise on climate change adaptation and resilience. The group spoke with Kristen Guida (Partnership Manager, LCCP) as well Helen Woolston (Environment and Climate Change Coordinator, Transport for London) about the challenges facing London. 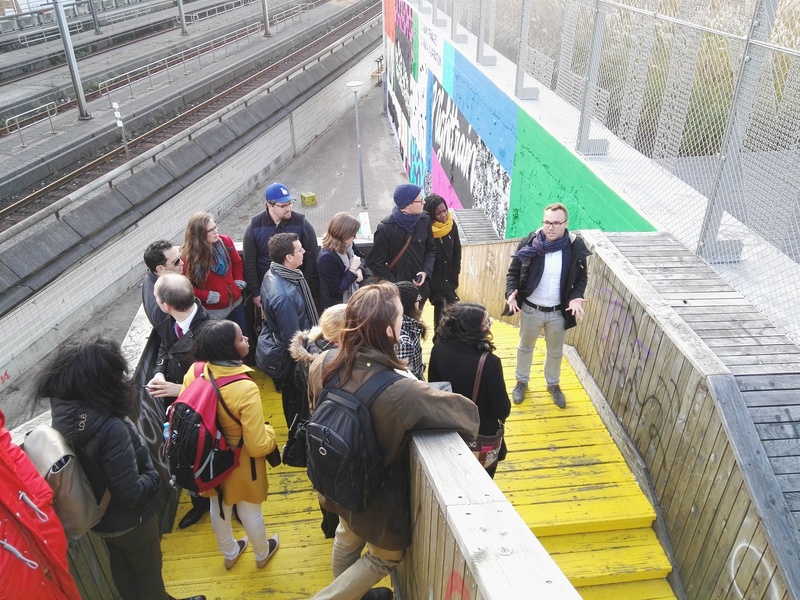 The participants learned in detail about the full extent of Transport for London’s operations and responsibilities, which include not only public transportation infrastructure, but also some more nuanced aspects of the city like the taxi service and bike lanes. One interesting take away from both the meeting with TfL and the session with Defra and the ASC was the often overlooked importance of the telecommunications sector in preparing for climate shocks. The first site visit of the study tour took place at the Thames Barrier, in the eastern part of London. The barrier protects more than 90% of the floodplain of Greater London from extreme flood events related to storms or high tides. The importance of the Thames Barrier was highlighted in many, if not all, of the other meetings in London, and the group was curious to learn about the future of the barrier. The UK government recently released the “Thames Estuary 2100 Plan” which looks at how to address flood risk in the estuary up until 2100, particularly considering that the Thames Barrier is expected to go out of service around 2070. The group was also intrigued by how the government handles criticism related to issues of equity: while so much attention is given to the area in and around London, poorer rural communities which may be at a greater risk from flood events do not get the same attention. After a quick trip on the Eurostar under the English Channel, the group arrived in Brussels with a busy schedule. On Wednesday morning, the Mayors Adapt Network was hosting a conference on “Supporting local climate solutions – Covenant of Mayors for Climate and Energy in practice: adaptation in the spotlight” and the organisers were generous to extend an invitation to the ELEEP group as active participants. The group members were keen to share their experiences with local approaches, and it was clear that the members of the Covenant of Mayors were excited to hear ideas from a transatlantic perspective. The topics discussed included the integration of adaptation and mitigation, implementation and financing of urban implementation, and more. Promoting adaptation in especially vulnerable sectors like fisheries and agriculture, as well as infrastructure. Over dinner, the group was joined by Ulriikka Aarnio, the International Climate Policy Coordinator at Climate Action Network Europe. The informal discussion touched on issues relating to international climate negotiations and the role of coalitions and networks in advancing the environmental agenda. The major theme for the final portion of our study tour revolved around the Netherlands geographic situation. It is a country that exists with entire provinces situated below sea level, and the second largest city, Rotterdam, located at an elevation of 0m. To see this in person, the group travelled by bus from Brussels, passing through the low-lying provinces of Zeeland and South Holland. On the journey, the bus passed over many portions of the Deltaworks, a series of large-scale engineering projects along the coast of the Netherlands protecting it from flood events and storm surges. Notably, the tour passed over the Oosterscheldekering, the largest and most complex of the structures featuring 62 steel doors across a length of nine kilometers. It is considered one of the most impressive engineering feats in modern history, and is often referred to as the eighth wonder of the world. The destination, however, was another storm surge barrier: the Maeslantkering located just outside the city of Rotterdam. The barrier protects the Port of Rotterdam, and the city itself, in the event of increased flood risk. Again, the structure is an impressive feat of engineering; it is one of the largest moving structures in the world, featuring two swinging gates the size of the Eiffel Tower. It is completely sensor-operated, removing the possibility of any human judgment playing into the decision to close the gate. After a tour of the barrier, the group headed into the center of Rotterdam, for more a more hands-on look at urban adaptation in practice. In the last 10-15 years, the city of Rotterdam has undergone something of a renaissance in terms of it’s perception in the Netherlands and internationally. Much of this is due to the carefully thought out planning that went into redeveloping the city which remains both aesthetically pleasing and functional, but also of great interest to anyone interested in issues of climate change adaptation and resilience. The group was accompanied by a group of trainees from within the municipality office of Rotterdam, who all work in different capacities, be it urban maintenance, water management, or innovation. The trainees acted as especially engaging “tour guides” for the city, showing us around various features of adaptive urban planning. 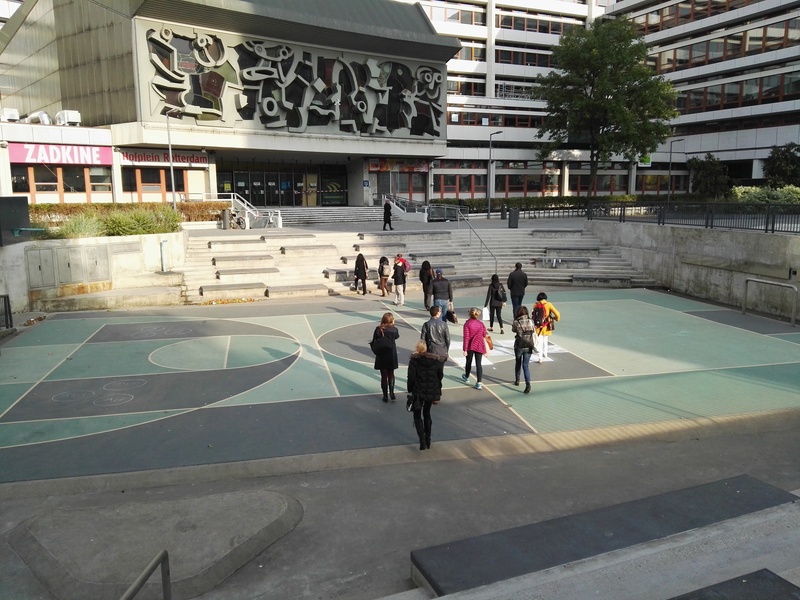 For example, they took us to the Benthemplein water square: a multi-purpose recreational space that serves as a water reservoir in times of heavy rains. Later, the group gathered on the DakAkker, Europe’s largest rooftop farm, to learn about innovations in urban farming.